You would have thought the Kiwis would have learned, wouldn’t you? I mean, the glut in the Australian wine industry has been around for a long time – overproduction, greed, and an unbounded enthusiasm that “our wine will succeed” despite evidence to the contrary, followed by heavy discounting as sales failed to materialize. So why did the Kiwis do exactly the same thing, only starting about 20 years later? “Since 2002, the review found New Zealand’s total vineyard area had increased by 144 per cent. This included a marked regional shift to Marlborough that now accounts for 75% of NZ production up from 47%. With New Zealand’s population at around 4.4 million, that’s one winery for every 6285 people. To put that into perspective in population density, that’d be one winery nearly every square kilometer in Singapore. “OK”, I hear you say, “but they’re exporting it right?” Well, yes but not maybe how you think. The review also shows that “since 2007, bulk wine exports grew by 1150% by volume and 480% by value, with average prices per litre falling from $6.30 to $2.90”. Wasn’t the New Zealand brand about quality? I once had a Kiwi winemaker complain to me that people (read consumers) didn’t understand or appreciate that New Zealand had a very high cost of production. So this is how it’s dealt with? So who’s dumber? The Australian wineries who got themselves into a mess decades ago, or the Kiwi wineries who followed (dare I say like sheep) into the same mess? You be the judge, and await Round Three. How’s the temperature in your wine fridge? We all know how important it is to keep wine at a constant cool temperature, either through a passive cellar (no, in a wine-rack in the dining room doesn’t count as a passive cellar), or if space is limited, a good quality wine fridge. But what happens to the wine before it gets into your cellar? I’ve watched with horror at bottles stored upright in so-called premium wine outlets, drying out the cork and the wine under hot, bright lights. But you don’t buy from there so you’re safe. Well, maybe not. A recent study, reported in Wine Advocate (The Effects of Shipping Temperatures on the Taste of Wine – John J. Bartholdi, III and Alejandro Mac Cawley, Supply Chain and Logistics Institute, Georgia Institute of Technology, and the Wine Supply Chain Council, December 19, 2011) might alarm you. The study looked at the carton temperature of wines shipped to the US from the southern hemisphere in unrefrigerated containers, meaning the wines had to cross the equator and we all know how hot being on the equator is. Here’s a summary of the results. Wine temperature whilst the wine was being delivered locally, and loaded on-board hovered around the 20-25 centigrade mark. Then, as the ship headed north, the temperature gradually increased, peaking around the equator at 31 degrees (in the carton!) before falling away to a more stable and acceptable level. So, is the wine fridge a good investment after the horse has bolted? The study is inconclusive on this point, but goes on to say that one possibility is that consumers may have become accustomed to the taste of shipped (read cooked) wines. An argument for refrigerated shipping or airfreight of course, but how would you know if that’s how your wines arrived, and there’s still those local delivery temperatures? 2007 / Peccavi / Margaret River / Chardonnay / S$52 at Wine Exchange Asia – A great wine and a good deal. 96 points by Halliday who reckons it’s got another 8 years in it. Retails for A$45 making this pricing pretty attractive. Vintage unknown / Lake Breeze / Arthur’s Reserve / Langhorne Creek, Clare Valley, Frankland River / Cabernet Sauvignon, Petit Verdot, Malbec / S$36.50 at Fairprice – Most supermarkets don’t seem to think that vintages matter to their consumers so they don’t quote any. Normally, I’d run a hundred miles from any offer without a vintage but in this case I’d possibly be doing myself a disservice. And that’s because James Halliday has given the 2006 and 2007 vintages a solid 95 points. The 2005 gets 92 points and you’d have to go back to the 2001 to see the rating drop below 90 so it seems buying anything current is a pretty safe bet. It’s good value too as it has a RRP of A$32. 2005 / Clarendon Hills / Astralis / McLaren Vale / Syrah / S$299 or S$199 by the case at Cornerstone Wines – This has to be the buy of the year! OK, so it’s only January but it’s going to take some beating. Why? Well this wine (modestly rated at 99 points by Wine Advocate) sells in Australia for between A$400 and nearly A$500. And it’s on offer here by the case at the equivalent of A$155. The younger you are the better of course, as this wine will supposedly drink all the way out to 2045 and longer. I’ll put one away for my 80th. 2010 / Clonakilla / Canberra / Shiraz Viognier / S$89 at Wine Exchange Asia – I’m always staggered when I see Clonakilla Shiraz Viognier on sale in Singapore at such attractive pricing. Next time you are in Australia, check out the pricing at Dan Murphys and you’ll realise what a great deal we are getting here. This is one of Australia’s great wines, year after year. The 2006 is listed in the “1001 Wines You Must Try Before You Die” and that’s a good enough reason for me to splash S$90 on the 2010. Halliday 95 points, but he’s not alone. Well, what to choose from this lot? In BBI order, the undoubted choice is the Clarendon Astralis. Even the single bottle price would put it as number one. Second (surprisingly for me) is the Lake Breeze but third is where my heart is, with the Clonakilla Shiraz Viognier. The Peccavi’s a good deal, but the competition today is intense. The Year of the Dragon opens well indeed. 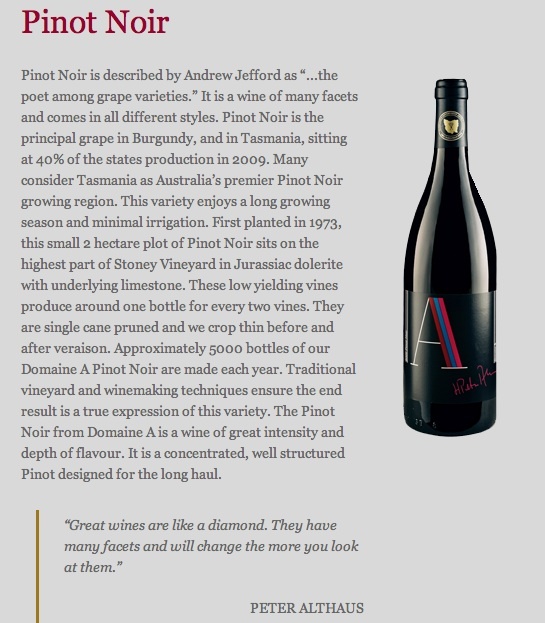 Tiger Wines (www.tiger-wines.com) has taken delivery of a wide range of Domaine A wines from Tasmania, and this week, we’re showcasing the 2007 Domaine A Pinot Noir.